Aren’t they CREEPY??!! Look at that dude’s eyes, he HATES YOU! …but that’s just because it’s licorice. Haters gonna hate, yo. This time though, they’re kinda right. These aren’t so great. Nothing very Euro tasting about these-not salty, not overly firm, not laden with various hints of forest spices. 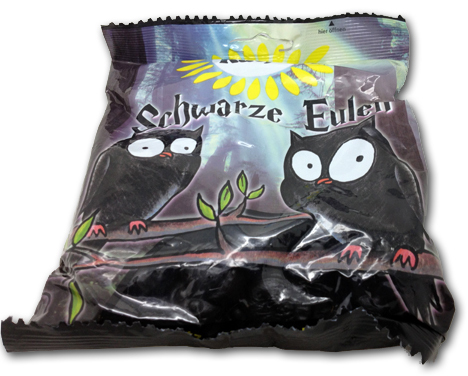 Just…kinda boring black licorice owls. But they’re SCARY! And it’s Halloween! 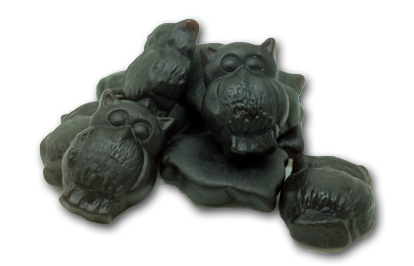 Still though, as a licorice lover, I wouldn’t buy these again. Katjes usually comes through, but this time, they delivered a bit of a “meh” candy. Have fun trick or treating, yo! Be safe. Fatten up.